North Port, FL, September 16, 2016 – King Plastic Corporation, a leading manufacturer of polymer sheets, slabs and massive shapes was pleased with the turnout at IWF Atlanta 2016. Attendees were able to “Step into Outdoor Living” at booth #2707 and see outdoor furniture and cabinets made using King StarBoard® ST and King DuraStyle®. 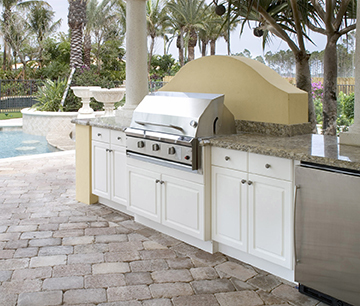 King StarBoard® ST is formulated to last a lifetime yet luxurious enough for the most elaborate applications from elegant outdoor kitchens to furniture. The King DuraStyle® Custom Cabinet Door Program puts precision door and panel fabrication within reach of cabinet makers that either don’t have the resources to CNC route the doors or don’t want to mix polymer shavings into their wood waste stream. Learn more about King StarBoard® ST and King DuraStyle® Custom Cabinet Door Program or to find a distributor. North Port, FL – June 1, 2016 – King Plastic Corporation, a leading manufacturer of polymer sheets, slabs and massive shapes, introduces the new and improved King DuraStyle® Custom Cabinet Door Program with easy to order style options for cabinetmakers and cabinet installers. The new 44 page King DuraStyle® catalog groups the cabinet doors into 4 categories: Shaker, Raised Panel, Beadboard and Slab. Style numbers assigned to the 46 door styles simplifies the ordering process. The King DuraStyle® Custom Cabinet Door Program combines King StarBoard® ST, the environmentally stabilized polymer building sheet, with designer styles, and state-of-the-art CNC fabrication. King StarBoard® ST is 25% stiffer than the original marine-grade polymer sheet, King StarBoard®, which makes King StarBoard® ST an excellent building material. Developed to withstand the harshest outdoor conditions, the cabinet doors will not warp, rot, or delaminate when exposed to humidity or water. King DuraStyle® doors are now available in 46 styles and nine standard colors. Custom styles, engravings and colors are available upon request. For decades, the original King StarBoard® product line has been the industry leader in the marine market. Since then, King has produced dozens of breakthrough products for a wide variety of industries. King continues to raise the bar with new products, new production techniques and new standards of excellence. Today, King Plastic brings marine-grade toughness and designer styles to the building trades market. 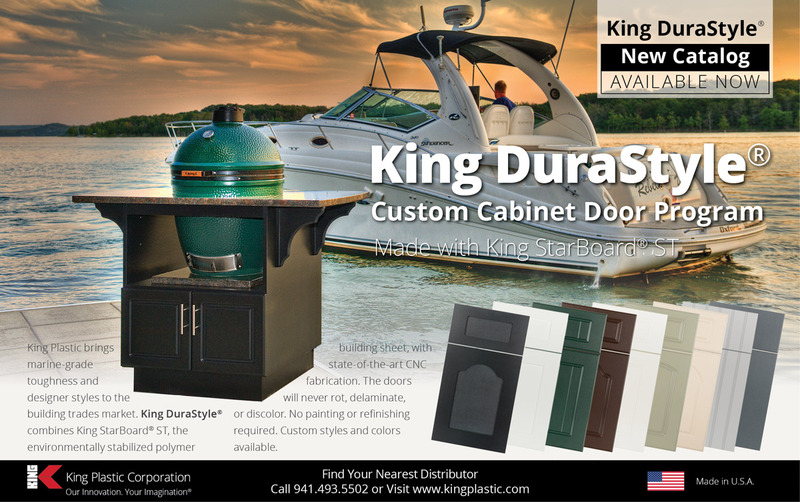 The King DuraStyle® Custom Cabinet Door Program combines King StarBoard® ST, the environmentally stabilized polymer building sheet, and state-of-the-art CNC fabrication. King DuraStyle® will never rot, delaminate or discolor. No painting or refinishing required. Custom styles, sizes and colors available. When it comes to designing outdoor kitchens – color, style and durability are at the top of must have list. Choose from 9 style doors and 9 designer colors. Mix and match colors, inside and outside profile options to your specification. 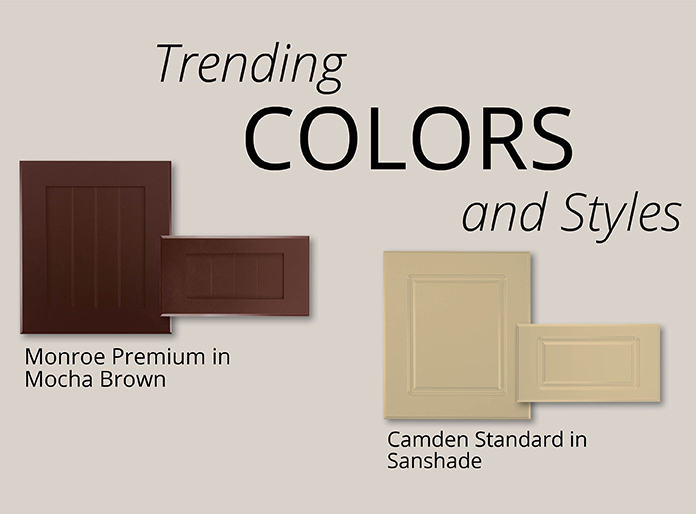 Below are trending colors and styles for outdoor kitchen doors ordered through the King DuraStyle® Custom Cabinet Door Program. Select your styles by previewing the King DuraStyle® photo gallery. You Build the Box. We Make The Doors. 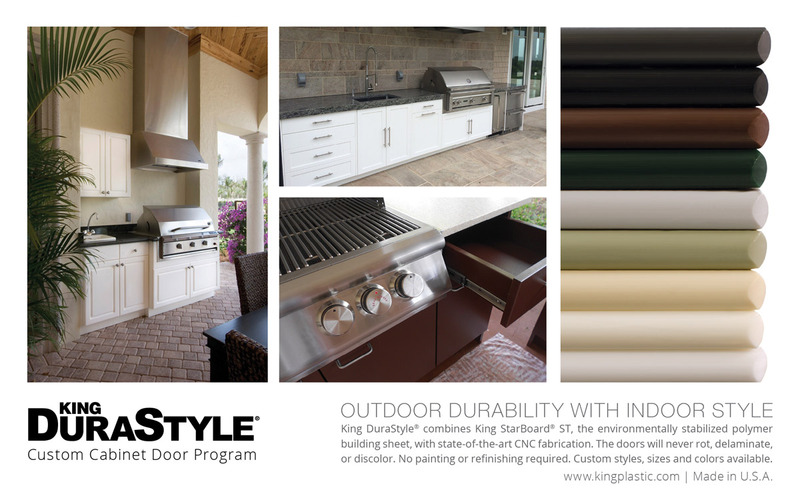 King DuraStyle® Custom Cabinet Door Program combines King StarBoard® ST, the original environmentally stabilized polymer sheet with designer styles, and state-of-the-art CNC fabrication. 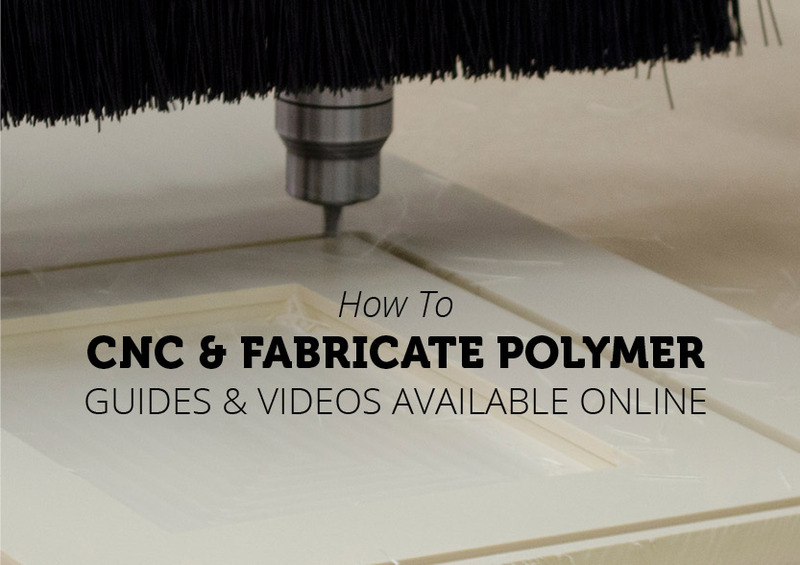 The high-density polyethylene will not warp, rot or delaminate. King DuraStyle cabinets work as well inside as they do in outdoor areas where there may be water, high humidity and moisture. They will never need painting or re-finishing. For questions about the King DuraStyle® Custom Cabinet Door Program, please contact us. King Plastic Corporation is a leading manufacturer of plastic sheets, slabs and massive shapes. Our products are sold worldwide through distributors. Find your nearest distributor today. North Port, FL, July 2, 2015 – King Plastic Corporation, a leading manufacturer of polymer sheets, slabs and massive shapes introduces King DuraStyle™ Custom Cabinet Door Program. This new CNC door and panel fabrication program is designed to help cabinet makers and installers take advantage of exciting new business opportunities in the fast-growing residential, outdoor living category, and commercial markets, thanks to a super-tough polymer sheet stock called King StarBoard® ST.
King StarBoard® ST is formulated to last a lifetime yet luxurious enough for the most elaborate applications from elegant outdoor kitchens to commercial, healthcare and wet-area cabinet installations. The King DuraStyle™ Custom Cabinet Door Program puts precision door and panel fabrication within reach of cabinet makers that either don’t have the resources to CNC route the doors or don’t want to mix polymer shavings into their wood waste stream. 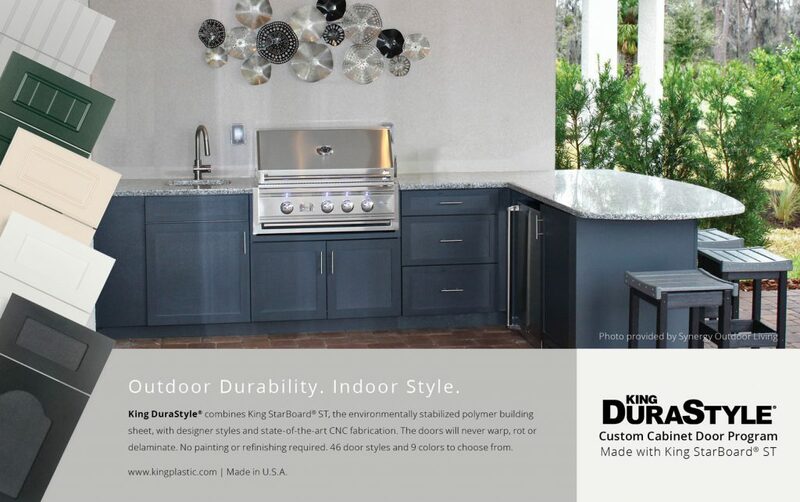 King DuraStyle™ combines outdoor durability with indoor style. 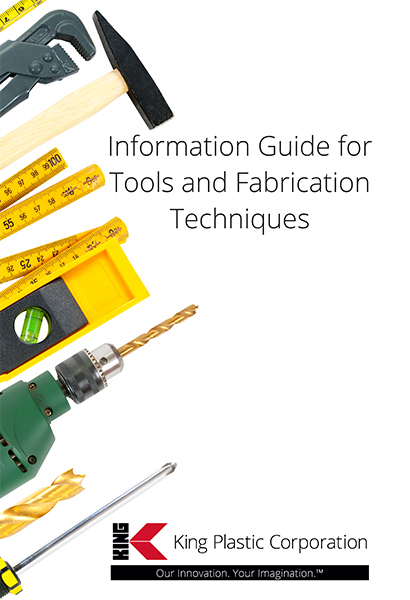 They will never need painting or re-finishing, will never warp, rot or delaminate. The doors come in several inside and outside profile styles as well as today’s most popular colors: Black, Mocha Brown, Evergreen, Everglade, Charcoal Gray, Dolphin Gray, Sanshade, Seafoam, and White/White. 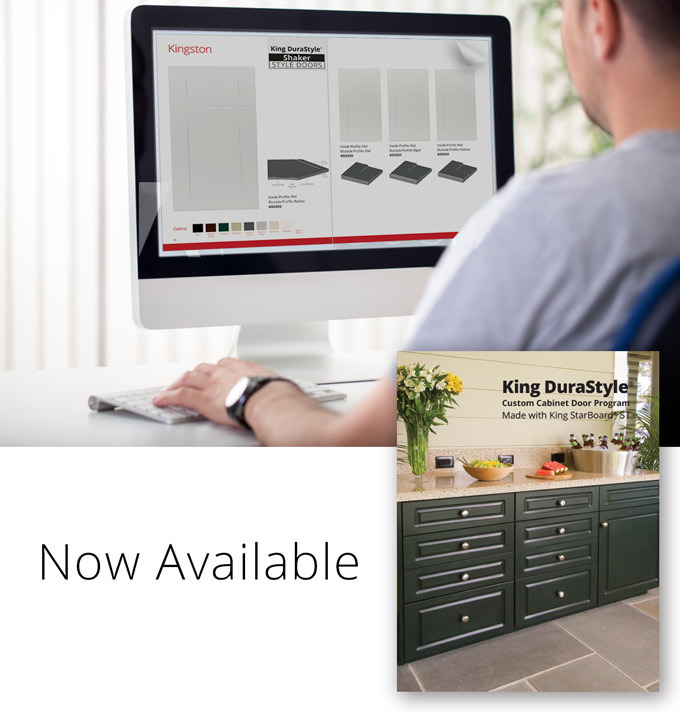 “King DuraStyle™ makes it easy for cabinet makers to order the finished doors their customers want, receive them promptly, and complete an installation within an efficient time frame,” King added. 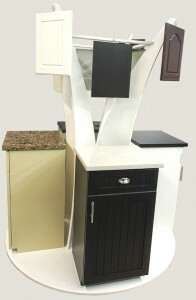 To learn more about King DuraStyle™ Custom Cabinet Door Program or to find a distributor, visit www.kingplastic.com. Founded in 1968, King Plastic Corporation is a leading manufacturer of quality polymer sheets, slabs and massive shapes—including several products pioneered by the company. Its polymers are sold worldwide through a network of top plastics distributors to customers who fabricate products for the Marine Industry (King StarBoard® Brand), Signage, Food Service, Healthcare, Architectural, Industrial and other Markets. The company headquarters is a 150,000 square-foot manufacturing facility in North Port, Florida. Visit www.kingplastic.com for more information.